Are kids and teens bored by your library catalog? Artists are transforming old classics into comic books and publishers roll out new graphic novels by the score. Why not add a similar visual punch to your public catalog? During a mostly unrelated conversation* this morning, my mind wandered and I started imagining a library catalog that provided content as if it were a comic book. Why not? A person searching a catalog is engaged in a dialog. Why not illustrate that dialog in a fun way? 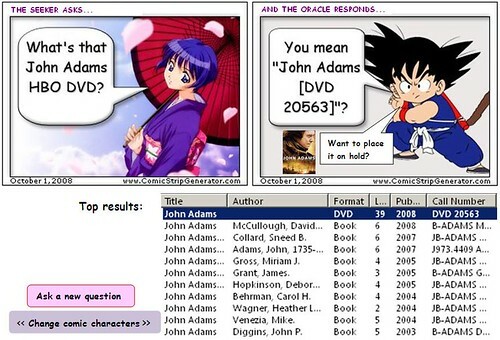 The catalog would still do its search magic beneath the surface, but the interface — the Q & A — could be channeled through a random comic book scene. Let’s say a teen opens the “Comic Catalog” to an illustrated scene featuring two characters. One character has a blank cartoon bubble overhead (or a bubble with prompting words like “Do you have …”). The teen types keywords into the bubble just as he would with a normal text box, but … he’s typing into a comic book! That’s the search box. Cool. Then he presses ENTER and watches the other character respond with the catalog’s top entry. Other results can appear in a list below, or may be selected and scrolled up into the comic interface. If you have several dozen images stashed in the catalog’s storage, the randomness of the comic scenes will keep it fresh. If a user wants to play a little, she can scroll through the scenes to find one she likes. Maybe the scenes could appear as upturned comic book pages that she can flip through. Sure, this is a gimmick, but it’s visual, colorful, and fun. A whimsical interface option might spruce up the catalog. We’re a Polaris library, so I ran the idea by the good developers in Syracuse this afternoon. It’s a busy week for them — their annual user’s conference begins tomorrow — but they listened politely and passed it around their work group. Sharon Ufer Lavell, our library’s collection services manager with whom I was talking when this idea arose, suggested customizing the user’s avatar or changing the background based on the call number of the top result. A kitchen background might appear, for example. Or a sport stadium. Or a zoo. What do you think? Should we seek a Comic Catalog? * Our original conversation: Is there an online database out there that provides full-content comic books? Well, is there? NOTE ABOUT IMAGES: The examples shown here were produced quickly today using a few simple graphical cut-and-paste tools and using images from ComicStripGenerator.com. Maybe a manga, anime, or classic comics-style illustrator could be hired to dash off a nice image collection for a Comic Catalog. You are currently browsing the LibraryStream blog archives for October, 2008.